if you're going to be at New York Comic Con this weekend, come by my table in ARTIST ALLEY TABLE N13 and then check out the charity art auction that they'll be holding on Saturday evening of the convention. proceeds go to St. Jude Children's Research Hospital. last year my original of Supers Coffee Break went to a great home. i'm grateful for NYCC for letting me help them on their quest to raise money for such a great cause. 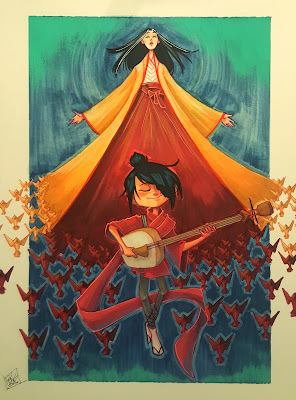 this year i decided to make this Kubo and the Two Strings piece for the charity. i used a combination of copic markers, colored pencils, inks, gel pens, and a little acrylic paint to make the whole thing. it's 11x14" on Bristol. i hope Kubo and his mom go to a good home as well.